Made at the renowned Matsumoku factory in Japan in about 1980. 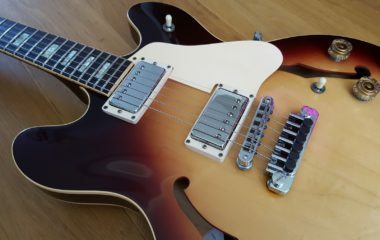 It’s a quality guitar – set neck, premium woods and great attention to details. Similar to a Gibson SG in many ways, but has better balance on a strap. 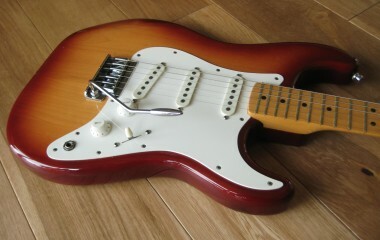 Finished in vintage sunburst. It’s all completely original, with untouched solder joints and everything working as it should. It comes with a hard case which looks right for the era, but has no branding, so I’m not sure if it’s original to the guitar or not. The frets have very little wear and overall it’s in excellent condition and has obviously led an easy life. A few marks here and there stop it being mint, but no cracks or repairs and the back of the neck is perfect. 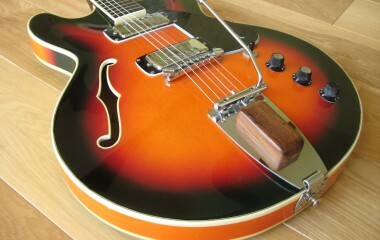 A great guitar with a good range of sounds on offer….